Butler’s Giving Away a Pair of Oregon Civil War Tickets! We have something special for all you Duck and Beaver Football Fans! 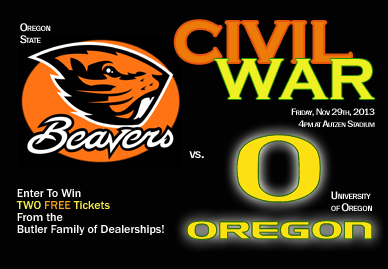 Butler Auto Group is offering 2 FREE Tickets to the Civil War football game between the University of Oregon and Oregon State University come 4:00 p.m. on November 29th! the game will be played at Eugene’s Autzen Stadium. All you have to do to enter is visit ANY of the Butler Automotive Group Facebook Pages (Butler Ford, Butler Acura, Butler KIA, Butler Hyundai, Butler Service Centers or Butler Automotive Group – you’ll find links over there to the right!) and look for the SWEEPSTAKES button under the cover photo. Click on the “Sweepstakes” button and enter your email address. It’s just that simple! The sweepstakes ends Wednesday, November 27th at 5pm. We’ll notify the winner that evening via FB and email. You must be 18 years old to enter. Only one entry per email address. Join us in being a proud supporter of community youth and sports programs!